Did I miss something? Who is Agassi? Hydrogen Fuel is better than electric cars because batteries contains poisonuos metaic elements that can ruin the environment and maintenance for recycling are expensive. Hawai should follow Iceland’s infrastructure. Hawaii’s geothermal can mass produce hydrogen at low cost. Who is Agassi? Do I need to look him up in order to know his name? Is he the CEO, Owner, CFO? I don’t know this Agassi guy, but the author seems to. Maybe they could elaborate. (For those reading this comment after Todd corrects this first year journalism student mistake, he failed to include this Agassi person’s name or title). are 95% recyclable. Li-on Batteries hold enough power for 10 years of use at 75% of original power. Old batteries can be used for other smaller applications after they no longer can power a car. Lithium Ion batteries are not even close to the regular car batteries for use with internal combustion engines as far as dangerous chemicals are concerned. You use less oil, because Power Plants are far, FAR more efficient than an Internal Combustion engine used in cars. I lived in hawaii for 3 years, I think this will be a great idea. Read the second paragraph…Agassi (not the tennis player) is the CEO of Better Place, and oil does not produce all the electricity used to charge an electric car. Agassi is the BETTER PLACE CEO. His first name is SHAI. Didn’t see it? Did you read more than the first paragraph? Not the Tennis player. lol. Can’t wait to see the day when we have more wind and solar farms here. 10% oil dependency reduction is not enough here. Looks like Shai Agassi is the founder and CEO of better Place the Electric Car Co. that is providing the vehicles to Hawaii…wasn’t to hard to figure out, it states that in the opening paragraph, and previous articles. In Texas it is common for some people, particularly sales and service personnel, to drive over two hundred miles per day, in summer temperatures over 100 degrees Fahrenheit. Many commuters spend over 90 minutes per day driving to and from work, much of that due to traffic slowdowns on freeways. Electric-only automobiles cannot compete with gasoline-powered automobiles for those people. But on an island where distances between destinations is only a few miles, such as Hawaii, “topping off” at each stop will allow electric vehicles to be fully ready for the next short trip. The other thing in their favor is that thieves who steal automobiles cannot easily remove them from the island and then have a market to sell them to. I don’t see this working in Texas, especially rural areas where there is a great distance between towns – and no charging infrastructure. I also don’t see this working in most large cities, again because the electrical infrastructure has to be greatly changed to accomodate charging vehicles. And the is too much vandalism going on – imagine graffit artists painting the contacts – to be providing charging stations curbside for cars parked on the street. Most businesses are not going to provide charging stations in their parking lots, most apartment complexes are not going to provide charging stations in their parking areas, and most homes do not have adequate service in their service areas to accomodate all households having electric cars to be charged. I do see electric hybrid automobiles like the Chevy Volt being used and individual buyers, middle-class electronic enthusiasts especially, buying these and ‘retrofitting’ their homes’ electrical wiring to be able to charge the vehicles’ batteries. Especially after they install electric solar panels on their roofs with battery-storage systems. Give it another 10 years to become a building code requirement that all new buildings have ample service and electrical circuitry to be able to charge at least one electric vehicle’s battery at a time. Ironic… most of the electricity generated in Hawaii is from oil. oil-> automobile, or oil->electricity->automobile? Oh please. PIPE DREAM!! We can’t get our roads done, can’t figure out what to do about the rail system, where is the bus system we we were supposed to get, and now the latest “blow your skirt up” is an electric car network? Come on now. What’s next? The old “dump the garbage in the volcano” fantasy? I am a rare breed in that I am a Republican on the big island. But please Ms. Governor, pull your head out and get a gripe. Wow, there are some ignorant people out there…that’s what’s wrong with the world today. Tennis star?!? Hydrogen?!? God, not this debate again…it takes more energy to make hydrogen than the electricity it makes or by burning it. All of you who just read a little bit didn’t read that Hawaii is moving toward 70% renewable energy…Chevy Volt…100 year old technology that’s now making it in the headlines?! Oh, and Renault-Nissan is making the electric cars, not GM, not Ford, or Chrysler. If GM had their EV1, they would have had the market on this one…too bad they didn’t have any vision. I am all for any technology that makes the Middle East irrelevant. Electric cars do not use any “fuel” when they are stopped in a traffic jam – the amount of electricity it takes to get to work is the same at 5 mph as it is at 80 mph, if not less. For Texas and others who drive 200 miles a day, quick swap batteries like they used in the electric buses at the Beijing Olympics make the most sense. Nissan developed that system back in 1947. Upgrade the Interstate Highways with wireless electricity transmission to provide power to electric vehicles creating unlimited range. Update and enhance existing interstate highway system by adding power for electric vehicles – for example, it is possible as M.I.T has demonstrated to wirelessly transmit electricity. If a system were created that ran along side the major interstates that could provide 100% of the electrical needs of an electric vehicle then we would have virtually unlimited range without burning a single drop of gasoline. As a vehicle left the interstate it would fall back on internal batteries. As it enters the interstate there is no need for a toll booth as the Wi-tricity (short for “wireless electricity) system would communicate electronically with the vehicle and monitor it’s electrical usage automatically billing the owner or driver of the vehicle. To stimulate the purchase of all electric vehicles there could be a period of time when the system is free to use for non-commercial travel, although how this would be implemented with the private utilities sector is yet to be determined – perhaps as tax incentives and subsidies for a 5 year period, afterwards regulated charges can and should be in place. This is a major undertaking as the nations electric grid will need to be modernized to handle the new power demands as well as new power generating stations constructed, ie nuclear, wind solar etc. to handle the increased electric demands of our nation. Tens of thousands of jobs will be created to build the system as well as high technology jobs within the related research fields. Sure, electricity->hydrogen->electricity is a lossy process (What isn’t? ), but you can generate renewable electricity (solar, wind, geothermal, etc.) to begin with. Even if you’re burning fossil fuels to generate the electricity, you get much better efficiency and can do more to mitigate emissions (see: carbon sequestration) at centralized power plants. Whether it’s better to have electric cars with batteries or hydrogen fuel cells (or both, or something else entirely) isn’t completely clear yet. The industry seems to be moving forward with both. What is clear is that gasoline/diesel is not a good long-term plan. on December 3, 2008 at 11:55 am | Reply Chris Jordan, Santa Cruz, CA. I cannot believe the hypnotic oil thoughts! Over and over, in CA and HI. Cannot people read, or just fly through comments to post something that was already shot down! Solar, wind, thermal, wave…. duhhh…NO….oil oil oil. SHEESH! This is a thrilling idea- especially for an island. Brilliant idea. It is just 25 years too late. Had one of the Big (and dumb) Three used the Hawaii islands as a test bed for electric cars during the last oil/gas crisis there would be a foundation of alternative energy transportation. As it is the Big (and dumb) Three missed the chance to change the world and become the really Big Three. It just proves my point, humans (especially executives) like water or eletricity always take the path of least resistance. It is just TOO HARD for anyone to change until change is thrust upon them. on December 3, 2008 at 4:02 pm | Reply Seth, Virginia Beach, VA. I like this idea, and what better place to have a laboratory than a small island. I hope it works for them and they can perfect it over time to work in bigger places. I am still for drilling oil as well though…..this way we can really put a hurting on the M.E. and Russia. Because batteries are not capable enough to power semi-trucks or farm equipment. Waste all the money you want to waste on these dreams. The cold hard fact of the matter is this. Nothing is gonna replace oil for at least another 30 years. Get used to it. How interesting to watch, however hawaii is a third world nation where, the fountain of graft and corruption at the pump or the plug will just be business as usual. Hawaii is 2500 miles away form any form of remedy or threat to its completely malignant cancer called local government. At the bar at, the bench, and in every office in the state, what runs hawaii is a good old “ho bra da” and a box of malasada donuts. This is all that is needed to trump the law of the land and steal from your neighbor. Who incidentally is usually the “stupid haole” (white person -willing to trust a local on their word ) next door. I whole heartedly agree with Hawaii. We have been taken to the cleaners once too often by the oil companies and foreign producers of oil. Electric cars are the way to go and it can be produced right here in the USA. If we went all electric we wouldn’t have to go to war in Arab countries because of our thirst for oil. The savings would be in lives and money not spent on war. People are going to be needing trucks and farm equipment long after there is no oil left to drill, but fortunately diesel engines run just fine on biodiesel, although there are some awful big batteries out there – submarines run on batteries. Burning coal and oil is criminal, because it causes global warming. There are surely products that can be made from coal, such as carbon fiber, and oil is worth twice as much for petrochemicals than it is as a fuel. Electric cars are simpler and cheaper than gas cars (when produced in volume), there is no maintenance (the EV1s were brought into the shop every 5,000 miles to rotate the tires and fill the washer fluid) and the “fuel” for an electric car costs the equivalent of buying gas for only 60 cents a gallon. So the quicker we make the transition the better. Electrical Cars are not a solution for this country if there are still attached to “Coal” plants, they just will increase the consumption of Coal and more green houses. The water engine is a much better solution since it is in abundance and can be independent of oil and coal consumptions. To make it work we need the infrastructure along the Highways and Cities. There are already prototype in England, and it works. This sounds great but I’ll bet that Better Place charging stations will only charge electric cars bought from Better Place. They’ll have a monopoly on electric cars if it works that way. The need for wars and blood will not be quenched for a very long time, my friend. That problem has far more to do with human nature, and what the great powers have planned for joe plumber … than racism (Arab phobia), or mutual human dependence (the interconnectedness of humans, and groups of humans) or even the current perceived shortage of resources and growth. Until we get our own planets we have to share this one. In order to free ourselves from evil we must first look within. The problem of resources, racism and mass conflict however does weave an intricate network for study with connections abound. Once again we solve the problem by looking within. It begins with yourself. Your power, and ability to change and improve yourself and the world around you. We just hope it is for the better. Your comment that internal combustion engines are less efficient than steam fired power plants is WRONG. Exhaust toxicity is a separate problem. Ask any engineer. That doesn’t mean we shouldn’t try to generate e power with different methods such as nuclear or geothermal (Pele forgive us) but all comments on the lower maintenance cost of e drive vehicles is very true with the exception of batteries. We must keep working on various battery designs. I will buy one now for local commutes and local driving in our small town. Ken, the working Electrical Engineer. Electric cars don’t use power when they are stopped in a traffic jam??? Haven’t you ever heard about air conditioning? Or, at minus 30 degrees, you might want a little heat in the car–and electric heating will really drain the battery. Of course, if the manufacturers don’t improve their quality control, the lithium ion batteries might solve the heating concern–just ask the laptop computer manufacturers. Those burning batteries first occurred in 1996, and we are still seeing recalls because of this problem. Hawaii -> Volcano -> Geothermal -> Electricity -> electric cars or hydrogen fuel cell cars. By the way, I am not Joe Perry the Aerosmith guitarist. So is Agassi the tennis player. regarding terry’s comment about charging stations on the freeway…if you read the sources you qouted, the articles say that technology wont be perfected till 2050..not to mention the logistical and financial difficulties of creating power transmitters that can connect and charge batteries moving 80 mph. Also, lets hold our appluase until we find out exactly how much Better Place is charging per mile for battery usage…added to car payments, and assuming Better Place seeks a profit, this could quickly run its way into unaffordable for a great majority of people. 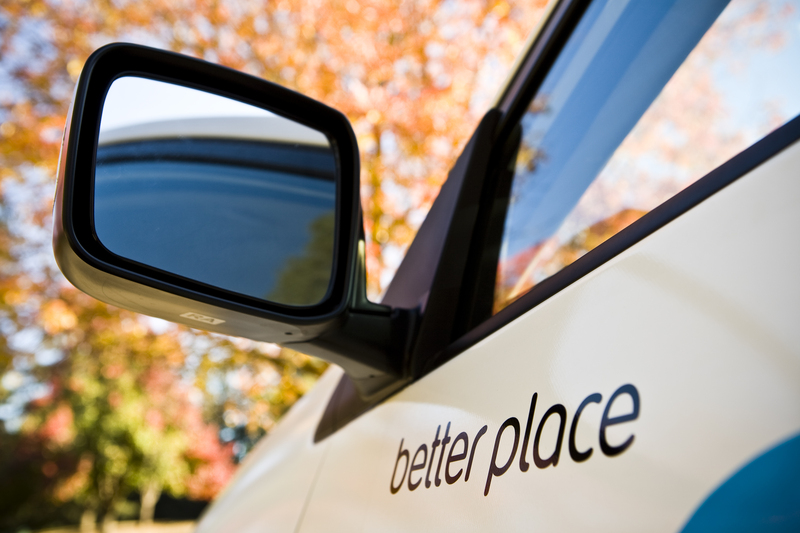 Better Place definitely wants to make a profit. Most definitely. Regardless, Hawaii has to do it. They import their oil and strategicly the most vulnerable of all our states. People will go to Hawaii and pay whatever price to ride an electric car, because that is all they’ll have to rent. Imagine the price of petrol for those who still have non-electric vehicles. Wow! Are you serious??? Submarines are run by nuclear power plants. People like you have no clue what it takes. Compressed Natural Gas, which is considerably cleaner tha gasoline or diesel,is probably the best alternative for trains and large trucks. Besides, that submarine battery is so large you could only transport a about 10 crates of oranges on the space the battery didn’t take up. It will take at least 50 years to switch every car over to electric. Not because we can’t make the cars that fast but we can’t make the power plants that fast. Well done, they are taking a page from http://www.newgenerationgas.com, a web site dedicated to educating the public on going green. Just make sure you don’t burn up more coal to generate this electricity. regarding terry’s comment about charging stations on the freeway…if you read the sources you qouted, the articles say that technology wont be perfected till 2050..not to mention the logistical and financial difficulties of creating power transmitters that can connect and charge batteries moving 80 mph. “Rattner spoke of technological transformations he expects by the year 2050. Keyword is ‘transformations’ followed by ‘cut the last cord’ – meaning that by 2050 no more electrical cords. The technology works today in the lab, now it’s only an engineering problem and a marketing problem. No problem charging a moving vehicle, build multiple transmitters along the interstate at regular intervals, as a vehicle moves out of range of one transmitter it comes in to range of the next, remember it’s WIRELESS. Expensive sure – So was the moon landings, and the building of the original Interstate system, but in the long run it would take a MAJOR chunk out of our energy dependence currently estimated at $700 billion per year. Phone and power line infrastructure already parallels may many roads in the U.S. and it may be of use for this new system. Short sighted on your part – So the technology isn’t perfected for market today, so don’t develop it for future use? I guess you think that planning for the future and spending money on R&D is a waste of time?